COLOMBO, Sri Lanka (AP) — Sri Lanka’s president on Sunday assured non-interference in ongoing investigations into abductions, killings of journalists and other crimes allegedly committed by those connected to the new prime minister and his Cabinet. President Maithripala Sirisena said that the courts and police would continue to function independently despite Prime Minister Mahinda Rajapaksa joining his government. He said “no one can interfere” with the police and courts. Sirisena’s remarks to foreign media correspondents came amid growing fears that investigations into alleged killings and malpractices mostly blamed on the immediate family members of Rajapaksa and his Cabinet ministers would be stalled with Rajapaksa’s appointment as prime minister last month. 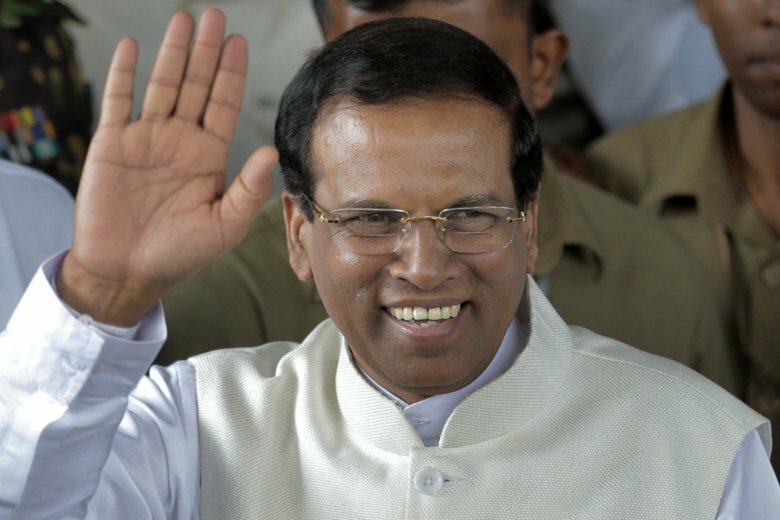 “With a political change of this nature, there could be different thoughts, but my policy is that they should not change,” Sirisena said when asked about the fate of the investigations with Rajapaksa, a former strongman president, now in control of the government. Rajapaksa is considered a hero by some in the ethnic Sinhalese majority for ending Sri Lanka’s long civil war by crushing ethnic Tamil Tiger rebels. However, his time in power was marred by allegations of wartime atrocities, corruption and nepotism. Sri Lanka has been in a political crisis since Oct. 26, when Sirisena abruptly fired Prime Minister Ranil Wickremesinghe and appointed Rajapaksa. Both claim to be the legitimate officeholder, with Wickremesinghe saying he has majority support in Parliament and his firing was invalid. On Friday, lawmakers opposed to Rajapaksa won control of a key committee that sets Parliament’s agenda, dealing a severe blow to his leadership. Previously, Parliament had passed two confidence motions against Rajapaksa. As a result, the parliamentary speaker, Karu Jayasuriya, said the prime minister and the government do not exist. The votes on the no-confidence motions were taken by voice votes as Parliament turned violent, with rival lawmakers exchanging blows. Meanwhile, lawmakers supporting Rajapaksa threw books, chairs and chili powder mixed with water to try to block the proceedings. Rajapaksa rejected the results of the vote, saying important issues should not be decided by voice. He also insisted the speaker had no authority to remove him and said he is continuing to work as prime minister. Tensions had been building between Sirisena and Wickremesinghe for some time, as the president did not approve of economic reforms introduced by the prime minister. Sirisena has also accused Wickremesinghe and another Cabinet member of plotting to assassinate him, a charge Wickremesinghe has repeatedly denied.